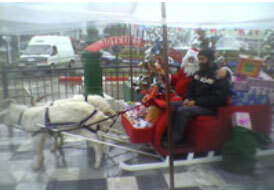 On December 24, 2006 - Christmas Eve - the Algerian daily El-Shourouq El-Yawmi published an op-ed complaining that Santa Claus, in full holiday regalia, was on the move in the streets of Tizi Ouzo, in the Algerian Berber region of Kabylie. The article described what it called the "Christianization" of the region as "the death arriving from the West." "Santa Claus Came Down… Without Asking Permission"
"We couldn’t believe what our eyes saw as we roamed the streets of Tizi Ouzo. If it were not for this photo caught by our camera, we would have said we were lying, and you would have said we were lying as well - and rightfully so. The Goats Drawing Santa's Carriage Show "Signs of Distress at the Imitation of Christians"
"The holiday atmosphere on the Christian New Year is evident also in the fact that the large square in the city center is decorated with red lights, and the shops write on their windows 'Happy [New] Year' in French. "Faced with this shedding of principles of faith and culture, the mosques, in the region and beyond it, continue striving to awaken these people from their Western intoxication - especially in these kinds of regions [i.e. Berber regions] and on these kinds of occasions [i.e. Christian holidays], where religious awareness is so lacking that tears of grief are shed." "Santa Claus Appearing… is a Sure Sign of the Swiftly Descending Danger"
 El-Watan (Algeria), October 17, 2004. L'Expression (Algeria), April 17, 2006. See, for instance, T. Ould Amar's article "Jesus en Kabyle" (December 28, 2006), and Mourad Hammami, "Le Christianisme gagne du terrain en Kabylie" (September 10, 2006). El-Shourouq El-Yawmi (Algeria), December 24, 2006.